The Internet is saturated with marketing how-to’s on making your online content more authoritative and trustworthy. The tricky part is to wade through it all and find what works for your business, budget, and workflow without compromising your style, integrity, wallet, and long-term goals. Biserka Anderson cites a recent study by TNS UK in her Business 2 Community article that supports the notion of “information obesity” (“infobesity”). “[T]he sheer amount of data spouted out into the digital space seems to be too much for consumers to digest, causing a consumer backlash against the information overload,” Anderson says. Food references aside, it’s important for businesses “to understand how their target audiences process information,” says Anderson, and take it from there. Do I have something to say? Your true experience is valuable but a collation of generic facts found online is not. Will my words help the reader in any way? [T]he blogs [should have] a combination of an experienced author with a lot of deep research. […] Are you providing the same value? Why am I doing this? You do not have to start giving out tips just because there are many other examples out there. Listing your sites in the right places and doing the occasional guest blog might be more rewarding than pushing yourself to produce content every day. I want to talk to my target audience. 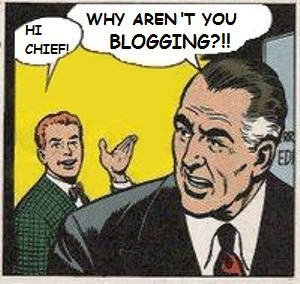 [I]f you are bent on taking on the challenge of maintaining a blog — find the right people. […] You can get professional help from such companies to get the right content around your product and business. It does not have to be everyday — you could do a deeply researched piece once a week. At SixEstate, we maintain a set of Newsblogging standards and guidelines, and train all our bloggers to adhere to them — for consistency, transparency, maximum efficiency, and for everyone’s sanity. There a few things you should do when starting a business blog to become a leading online voice and achieve thought leadership within your industry or around your cause. It’s entirely possible to put together a solidly designed site and outfit it with plugins and other helpful tools for a reasonable amount of money. If you can’t do it yourself, outsource. You can even buy a premium WordPress theme from WooThemes or StudioPress for about $70-$100. Ideally, aim for a well-written, strategically optimized, and copyedited daily blog built around your keywords. If you can’t commit to doing it yourself or can’t write, it’s best to leave it to the pros. No ghostwriting. Transparency is crucial: bylines, bios — your readers should have no doubt who is behind all this writing. Your posts should link out to news sources or other resources that will benefit your audiences and add credibility and additional perspective to your content. To protect yourself and to appear credible to your reader, add a related, copyright-permissible image, with a proper credit and link in a footnote (source citation) to each post. Also, mention the journalists’ names from your sources and include their titles or brief descriptions of what they do. You never know — they might Google themselves, find your post, and that could bring in some desirable visibility among the industry experts and influencers who are covering the same topics. Even if you’re not the principal blogger or you have someone else write for your blog, your expert opinion is still valuable and should be heard. Customize your content by inserting your perspective (in an occasional guest post, perhaps, or by supplying a quote to your bloggers). You can also spice it up by providing a case study with some original research and its analysis, and by publishing firsthand interviews. Also, enable comments and respond to them. Responding to comments in a timely fashion, and extending the discussion, is a great way to build a loyal and active audience. Also, post regularly, optimize, and edit. Every blog post needs an editor, or at least a fresh pair of eyes. At SixEstate, we have editors who edit, strategically optimize, and schedule all of our client blog posts. You need someone to catch that typo you’ve been staring at (and not seeing) for the past hour, and make sure links and facts are accurate. Another important aspect of the editing process is establishing a certain style, or picking an existing one (like AP or Chicago), and sticking to it. It doesn’t matter if you still spell “web site” as two words, or worship the double dash but banish a serial comma — just be consistent. Train your bloggers to be consistent. At SixEstate, we’ve ended up with AP style, but with a few deviations. Sometimes, when we can’t decide on a version of a word or a phrase, we Google it, and the search result with the most entries wins. Accuracy first, then clarity, then precision, and last, if there’s time, elegance. Image by Mike Licht, NotionsCapital.com, used under its Creative Commons license.